On World Oceans Day people around the planet celebrate and honor the body of water which links us all, for what it provides humans and what it represents. Be a part of this growing global celebration! Thanks to The Ocean Project and The World Ocean Network for helping to promote and coordinate this event since 2002. Anyone who has followed this blog for a while, might have come to know that my family loves the water, and loves the water's edge, AKA the beach. I find that going to the ocean and to the beach is exciting and relaxing at the same time. It's fun and it's educational. It's just the perfect place to be with kids and adults. There's always something to do and to look at, and I always feel recharged and refreshed after a trip to the beach, or a day swimming and playing in the ocean. Here are some ways you can celebrate World Oceans Day with your kids, or just learn more about the world's oceans any time of the year, and maybe also get to experience those oceans, and even get involved in protecting them. 1. 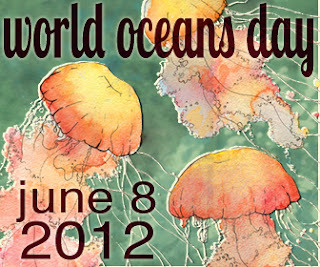 Attend a World Oceans Day event - The World Oceans Day website has a listing of events taking place all over the world. Maybe there's one near you to attend with your kids. For example,the Vancouver Aquarium has several family activities related to World Oceans Day. 2. Visit an Aquarium - Many bigger cities have Aquariums or Science Centers where adults and children can learn about oceans, the environment in general, and about the creatures that live in the ocean. The Vancouver Aquarium is definitely one of my kids' favorite places to visit, and I think most kids find underwater creatures of all kinds to be fascinating. I think it can definitely help encourage an interest in the environment and science. 3. Take part in a shore-cleanup event - These are events when people get together to clean waterfront areas from debris and garbage. In Canada, the Great Canadian Shoreline Cleanup website is a great place to find out when and where these events are taking place. We took part in a cleanup a couple of years ago, and the kids were very enthusiastic about picking up garbage that day! 4. Go beach-combing - This is one of our favorite weekend activities. All that's needed is a beach and a couple of buckets for the treasures. Shells, rocks, driftwood... there are a lot of beautiful things to find on a beach. And there are always creatures to look at, birds and crabs for example, and strange sea-life, like bullwhips and seaweed, to investigate. 5. Read a book about the ocean - Reading is always a great way to learn new things and get kids interested in the world around them. There are lots of great children's books about the ocean and about ocean creatures. Some books my kids like are Sherman Swaps Shells by Jane Clarke, A House for a Hermit Crab by Eric Carle, and Flotsam by David Wiesner. 6. Watch a movie about the ocean - Finding Nemo is a classic of course with lots of beautiful undersea life on display, as well as a lot of fun and adventure. My 5-year old daughter already likes some more documentary features as well, like Blue Planet, narrated by the fantastic David Attenborough. There are some great stuff in there about oceans and ocean life. 7. Learn to swim - This is an essential skill for everyone. Both my kids are currently taking swim classes, and I think it's one of those things most parents want their kids to know how to do. And if the kids need extra motivation, swimming is a skill that's needed for all kinds of ocean exploration, including snorkelling and scuba-diving! 8. Take a boat trip - If you have your own boat, you're probably already doing this. If you don't own a boat (I wish we did, but pesky reality keeps getting in the way...) then going on a sightseeing cruise, or renting a small boat for a day to go fishing or just looking around can be a lot of fun. Life jackets on for everyone, of course! 9. Take pictures under the water - Buy a disposable underwater camera, or get a water-proof case for your regular camera, and head down to the beach to take some fun photos beneath the surface. 10. Make an ocean collage - Look up fish and other ocean creatures online, and let your kids draw pictures of them on a big piece of paper: crayons, glitter glue, stickers... anything goes. You could also find magazines with images of fish and have the kids cut them out and glue them on the paper to make a collage.